Sorry for the interruption in the Journeys in the Disney Vault schedule. Let’s just say siblings coming to stay for extended periods of time…bad idea. Anyway, we return to the Disney films of the 1960s and I feel as if I’ve hit a rough patch for the next few weeks. Several of the movies in this decade I’ve either only seen snippets of, or flat-out don’t enjoy. The Sword in the Stone falls into the former category. I felt myself realizing something similar to when I watched The Adventures of Ichabod and Mr. Toad while watching this. 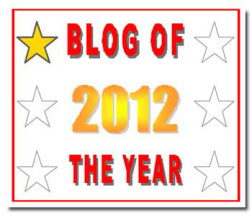 I believed that the portions I’d seen had been far longer than they were in the finished product. At a slim hour and sixteen minutes, The Sword in the Stone is a series of vignettes loosely tied together by the Arthurian legend. There doesn’t seem to be a set plot so much as cutesy scenes that lead up to one lone moment before the movie closes entirely. 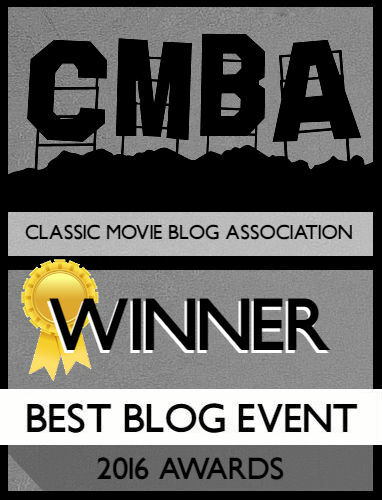 I’m not quite sure what I expected, but the movie feels far too lean to have any lasting impact. The magician Merlin (voiced by Karl Swenson) teaches the young Wart (voiced by Rickie Sorensen, Richard Reitherman, and Robert Reitherman) how to be the legendary King Arthur. The Sword in the Stone’s claim to fame in the Disney history books is that it’s the first to feature songs written by the fantastic songwriting team of Richard and Robert Sherman. I can’t recommend enough watching The Boys: The Sherman Brothers Story if you’re interested in the songwriting duo and their legacy of songs for both Disney and other films. The animation also comes courtesy of writer/animator Bill Peet who had a short-lived tenure at Disney Animation. His animation is lovely, and far more detailed than what we saw in 101 Dalmatians. The backgrounds are still lacking in defining characteristics, but it’s not nearly as sloppy. The colors are deeper and the background pops just as much as the characters do in front. 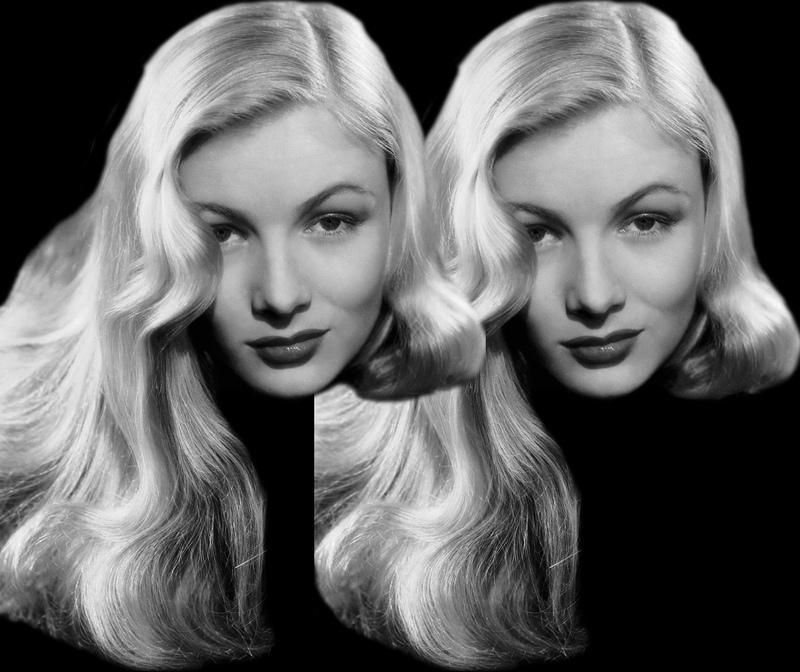 It’s not a vast improvement, and nowhere near as amazing as it was in the 1950s, but an improvement nonetheless. The Sword in the Stone also moves us away from animation teams directing the features to a solo director. Normally, these movies were directed by a team of animators underneath a supervising director, so it wasn’t rare to see three or four people credited with directing. Director Wolfgang “Woolie” Reitherman would be the director of the majority of Disney animated features all the way through to the 1980s. Having one director does allow for more cohesion in the storytelling, but you don’t see it here. 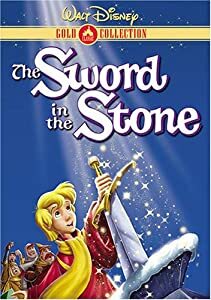 The fatal flaw of The Sword in the Stone is that despite being about the Arthurian legend the movie never seems particularly interested in it. The time is spent with Merlin teaching Wart various lessons under the disguise of different animals. The lessons are easy to grasp, but it’s never quite understood why the duo have to be animals in order to achieve these lessons. It just comes off as Wart wanting to be animals he’s dreamed about. Furthermore, the elements of magic Merlin employs are used more to show-off the animation as opposed to being a fun item to throw around and advance the plot. 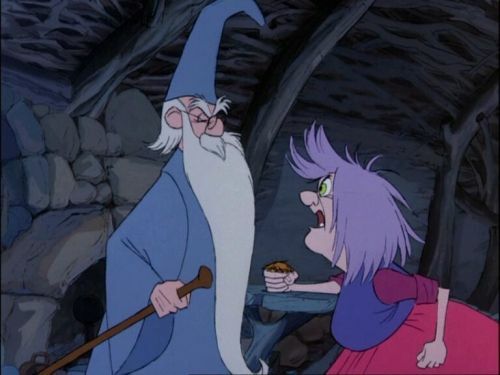 The big wizard battle at the end between Merlin and Mad Madame Mim is considered a touchstone in animation since Mim and Merlin are still identifiable despite their continuously changing appearance. I found myself comparing this against Monty Python and the Holy Grail, which would come out twelve years later. The latter film not only retold the story, but did so by mocking it while at the same time creating its own standalone story. 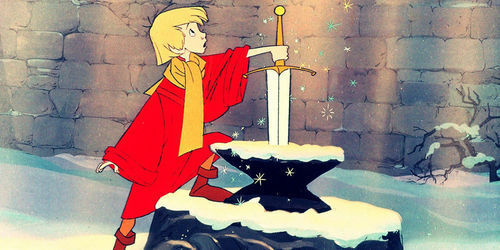 The Sword in the Stone creates a new story, but ignores the source material. The movie opens with the story of the sword coming from the sky and being planted into the stone, but the by the climax when Wart finally retrieves the sword the audience has to be reminded of it! The scene in question is presented so flippantly that it feels like the script doesn’t care about the titled sequence. Wart grabs the sword, the people are amazed, he’s hastily crowned and cut to black. What is the point of the movie ultimately? I don’t think the screenwriter or director does a sufficient job of answering that question. Other elements of the behind-the-scenes process feel slapdash in themselves. Three separate boys voice Wart, and his voice goes through a roller-coaster of ranges and tones that would make Peter Brady blush; mid-sentence Wart’s voice goes from low to high and I’m not quite sure why three separate boys had to be utilized? Is it because the recording process was different and the time was so extensive that each boy’s voice kept changing? It’s distracting and enhances the lazy tone that permeates the movie. The songs by the Sherman Brothers are also unremarkable. Aside from the one with the funny title, I don’t remember any others (and the fact I can’t name that one memorable one is bad too). The repetition of animal + lesson = hilarity becomes tired as well. 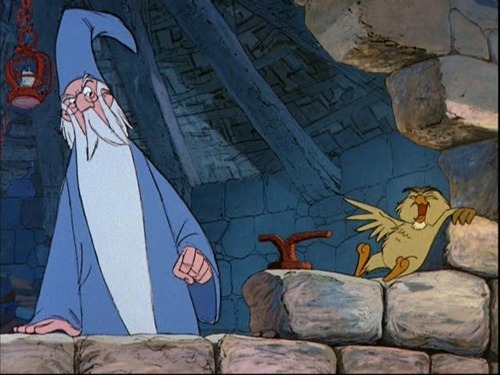 Merlin is teaching Wart under the guise he’ll be Arthur, but the movie feels like three or four cartoons strung together with the Arthurian story used as a binding agent. That one day Wart will be Arthur, but that’s going to be in a separate movie we’re not privy to. There are a few stray elements I enjoyed. The storybook opening returns, complete with a troubadour singing the opening narration. It’s a quirky, authentic treat to see opening the movie. The owl Archimedes (voiced by Junius Matthews) was my favorite character of the bunch. He’s grumpy, acerbic, and feels he’s above the lowly humans. I wouldn’t have discouraged seeing an entire movie based around him. You might recognize Matthews’s voice as he’s the voice of Rabbit in the Winnie the Pooh series (which we’ll be looking at in four weeks or so). The final sequence involving the wizard battle is what I remembered most before watching this proper. Strangely, I thought Mad Madame Mim was the top villain that followed the characters throughout the entire movie; that’s not the case. Mim doesn’t show up till 58 minutes into the movie, and only has about ten minutes of screentime. I recall the wizard battle being shown in a lot of Disney direct-t0-video products, as well as being shown on Halloween. It’s a fun sequence that is a work of animation prowess for the time. You never get confused on which wizard is which as Merlin retains his glass and facial hair throughout. The one-liners are funny, and it’s just a well-done sequence of animation and comedy. The Sword in the Stone doesn’t feel like an accomplishment in the Disney canon; it feels like treading water. Individual snippets are good, but the movie doesn’t mine any of the rich source material. The plot, what little there is, is inconsistent and diluted to a series of quirky animal adventures. Guess it’s appropriate that next week is an all-animal affair! Not among Disney’s strongest efforts, I admit, but the wizard’s duel alone makes it worth a look for me. The wizard’s duel was the point where I finally woke up, it’s definitely the best sequence.